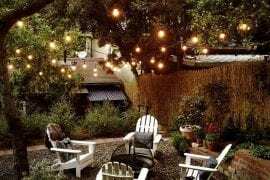 When it comes to playing your favorite soundtracks while traveling or just lounging at the backyard, portable Bluetooth speakers are the best choice. These high-performance sound accessories are in vogue and have very impressive features making them your perfect travel and adventure companion. 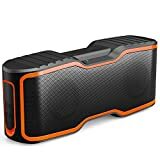 Choosing a good portable Bluetooth speaker can be very challenging, especially for individuals who’ve never owned or even experienced audio quality from these sound accessories. There are many portable Bluetooth speaker brands in the market. It takes a substantial level of experience to get the very best from the rest. When shopping for your favorite Bluetooth speaker, there are many factors to consider. 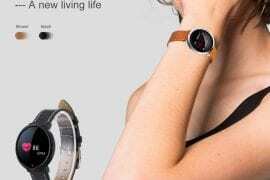 These include but are not limited price, battery life, weight & design, sound performance, and Bluetooth version compatibility. In this review, we have rounded up some of the best portable Bluetooth speakers you may wish to consider. If you are looking for a portable speaker with crisp clear highs and mid audio performance, check out the Sbode. It is equipped with double bass radiators for an impressive True HD 360o stereo quality. A pair of precision drivers further fine-tunes the sound output. The True Wireless Stereo function lets you pair 2 Sbode portable speakers for excellent sound performance. Simply press the “TWS” button and the left and right channel speakers will connect instantly for quality stereo sound separation. It is ultra-lightweight and portable, the perfect Bluetooth speaker for on-the-go listening. It’s also compactly designed and easily stows away in travel suitcases and backpacks. A high capacity Li-ion rechargeable battery supports up to 8 hours of continuous audio playtime. Durability & strength: Its casing is made of a high-quality woven mesh-like material for a rugged solid texture. The Sbode has an integrated mic which converts it into a speakerphone for convenient hands-free calling. There’s even an FM radio function that lets you tune to local radio stations for more entertainment variety. It has a humanization feature that powers off the Sbode portable Bluetooth whenever the standby mode lasts more than 10 minutes. Its outer casing is built of durable mesh-like fabric. It also has a rugged rubber design for enhanced aesthetics. 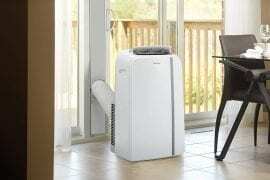 Its bass radiators and wind/noise reduction technology guarantees premium acoustic sound quality. 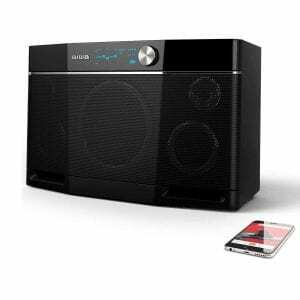 The Aiwa Exos-9 portable Bluetooth speaker has up to 5 active speaker drivers and a 6.5” dual voice coil subwoofer for a powerful and impressive 200W audio experience. Not many Bluetooth speakers are capable of such feats of audio power. It has a high capacity 57.2Wh Li-ion battery for up to 5 hours of continuous playtime. If you like partying with friends, this Bluetooth speaker is perfect for tailgating, camping, bonfires, fishing among other outdoor adventures. The Exos-9 supports Bluetooth streaming for an enhanced audio experience. Exos- 9 has a ‘Share Control’ feature that lets you pair your device with other compatible speakers within range. You can also restrict pairing to your devices only with the help of the Exos-9 Bluetooth Lock. Compatibility: connects with a wide range of iOS, Windows, and devices. It comes with a 60-day Aiwa Promise warranty for all accessory components. It has a very powerful 200W stereo output, backed by the 6.5-inch dual voice coil subwoofer and its 5 high-performance drivers. It has an inbuilt high capacity 57.2Wh Li-ion battery that guarantees up to 9 hours of unplugged indoor or outdoor audio playtime. Exos-9 has a customizable EQ and control panel for easy sound quality tuning depending on your select music genre. There’s no better way to experience extended audio playtime than with the AOMAIS GO Bluetooth speaker. With the 8800mAh Li-ion battery, this speaker delivers up to 30 hours of uninterrupted audio playtime. You can, therefore, take your music wherever you want to; indoors or outdoors. This Bluetooth speaker has a rugged design for enhanced aesthetics. Its IPX7 waterproof rating makes it suitable for use at the poolside, beach and even backyard use. It supports True Wireless System (TWS) function that allows for the pairing of 2 AOMAIS GO Bluetooth Speakers. This has the effect of up to 60W stereo surrounded sound output. TWS Function: Supports pairing of 2 portable Bluetooth speakers for a 60W surrounded audio performance. Bluetooth: Bluetooth V4.2 for seamless syncing and pairing with compatible devices. Battery: high capacity rechargeable 8800mAh Li-ion battery for up to 30-hours continuous playtime. Compatibility: pairs well with a wide range of iOS, Android, and Windows devices. Incompatible devices can be connected via aux 3.5mm input connection cable. It has Bluetooth V4.2 which pairs excellently with most devices. 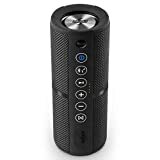 For non-Bluetooth devices, this Bluetooth speaker has the Aux-in mode for connection via the aux 3.5mm input cable. For an amplified audio quality, this speaker has the TWS function that lets you pair 2 AOMAIS GO Bluetooth speakers for up to 60W stereo sound quality. This portable cordless speaker has an integrated mic which supports hands-free cal function. It has a high rechargeable high efficiency 8800mAh Li-ion battery capable of up to 30-hours continuous playtime. 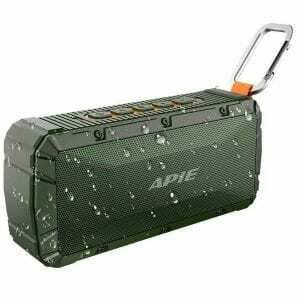 The APIE portable Bluetooth speaker has an integrated mic for hands-free calling and messaging function. It also comes with a powerful audio output, thanks to the dual 10W high-performance drivers and bass diaphragm. It is IPX6 waterproof rated, hence ideally suited for beach adventures and pool parties. If you like listening to your favorite soundtracks in the shower, this speaker won’t disappoint either. 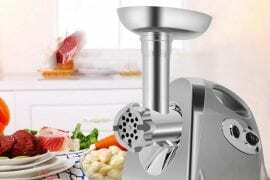 It features Bluetooth V4.1 technology for fast pairing with compatible devices. Devices that don’t support Bluetooth connectivity can be linked effortlessly to this speaker via an aux 3.5mm input cable. It has a wireless range of 33ft, so you can enjoy listening to your music from afar. For extended playtime, the APIE portable Bluetooth speaker has a rechargeable inbuilt 2200mAh Li-ion battery. The battery supports playtime durations of up to 10 hours. Sound performance: crystal clear HD stereo sound with impressive volume selection. Battery: high capacity rechargeable inbuilt 2200mAh Li-ion battery. Mic: has an inbuilt mic for a hands-free call and messaging function. Water resistance: It is IPX6 waterproof rated. The APIE portable Bluetooth speaker is compatible with most iOS and Android devices, thanks to the Bluetooth V4.1 technology that supports fast pairing with other devices. It has a high capacity 2200mAh Lithium-ion battery capable of up to 10 hours nonstop playtime. It has an inbuilt mic that supports a hands-free call and messaging function. 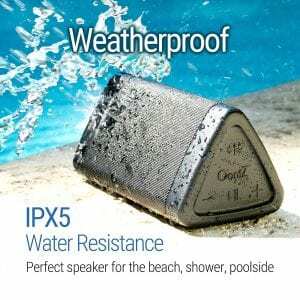 You can listen to your music in the shower, at the beach and even swimming pool because your Bluetooth speaker is IPX6 waterproof rated. It has a crystal clear high definition audio suited for indoor as well as outdoor listening. 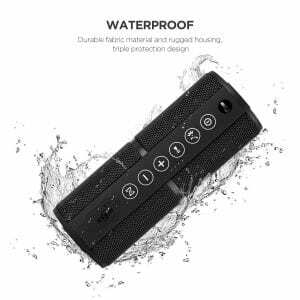 The AOMAIS Sport II Portable Bluetooth speaker is IPX7 waterproof rated, meaning it is all weather-ready. Take it with you on any extreme water-related adventures like kite surfing or even pool parties. It performs exceptionally even in submerged conditions; you can submerge it in the bathtub or swimming pool for more than 30 minutes, and it will still perform excellently well without a glitch. It has a very tough drop proof outer casing. The portable Bluetooth speaker’s casing is so rigid and strong that a car can literally run it over and it’ll still be intact, not a break or scratch. It is very compatible with iOS and Android-powered devices. 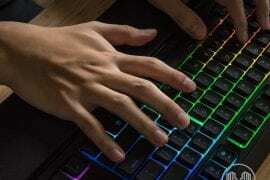 It also connects excellently with devices running Windows OS like PC and tablets. 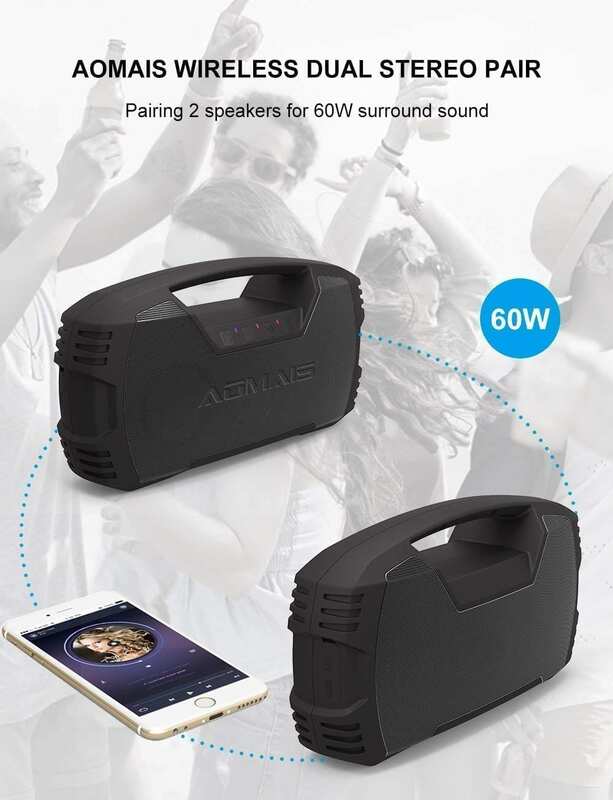 If your device isn’t compatible with this portable Bluetooth speaker, you can connect it using the 3.5mm aux input cable via the AOMAIS Sport II Aux-in audio input jack. Audio performance: 20W high-quality sound output with stereo pairing function. Warranty: 12-month warranty for all parts and components. 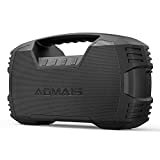 The AOMAIS Sport II portable Bluetooth speaker is designed tough to withstand high impact drops. Its IPX7 waterproof rating makes it ideal for all water-related adventures. Dive with it inside the pool, take it with you to the shower, or even bathtub and it still performs optimally with no audio hitches. 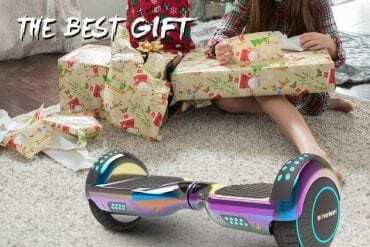 It has a high capacity Li-ion battery for very long playtime. It supports hands-free phone calling and messaging. This feature lets you receive calls and send text messages remotely. 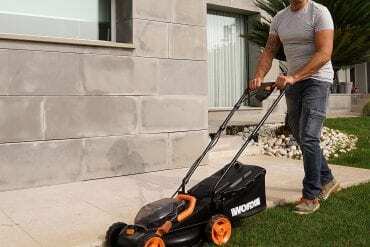 It has Bluetooth V4.0 for fast and effortless connectivity with compatible devices. Incompatible devices can be connected via the Aux-in 3.5mm jack. It has a 12-month warranty for all parts and components. 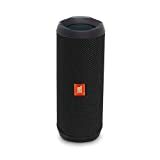 If you are looking for a portable Bluetooth speaker with a powerful stereo sound, it must be the JBL Flip 4 waterproof Bluetooth speaker. This is the next generation of JBL’s Flip series. It is IPX7 waterproof rated, perfectly suited for extreme water adventures. Take the party anywhere with this all-weather companion. JBL Flip 4 is equipped with an echo & noise canceling feature hence guarantees crisp clear hands-free conference calls. It has a rechargeable high capacity 3000mAh Li-ion battery for extended audio playtime; up to 12 hours nonstop playback. The JBL Connect+ feature lets you interlink more than 100 JBL Flip Waterproof portable speakers for a fantastic audio amplification. 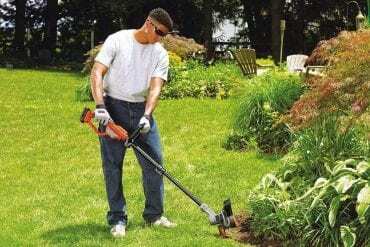 This only works with JBL Connect+ enabled Bluetooth speakers. You can also activate and pair this Bluetooth speaker to Siri, Google Now, and other voice assistants at the press of a button. It comes with an integrated JBL bass radiator for enhanced audio performance. Supports voice assistant integration. The JBL Flip 4 lets you activate and talk to Google Now or Apple’s Siri in a snap. The JBL Connect+ Feature allows for wireless linking of 100+ enabled JBL Flip 4 speakers to a single device. This greatly improves the audio experience. It’s powered by a 3000mAh rechargeable Li-ion battery that delivers close to 12 hours uninterrupted playtime. Its Bluetooth V4.2 supports fast pairing and sharing with compatible devices. For handsets that don’t support Bluetooth pairing, connect via the Aux-in 3.5mm input jack. 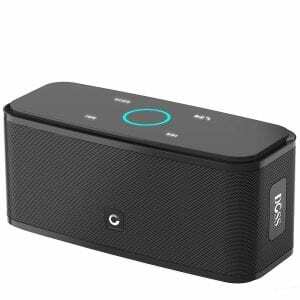 This smart Bluetooth speaker has a very attractive design and powerful audio output. The integrated Alexa function lets you control all your smart home devices with simple voice commands. 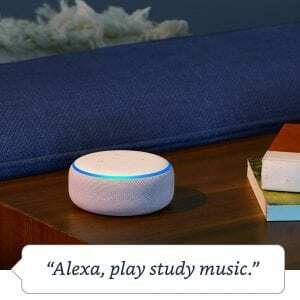 Request Alexa to play your favorite hit songs from popular streaming sites like Spotify, Pandora, and Amazon Music. Fill your home with impressive audio hits with the Echo Dot portable Bluetooth speaker. 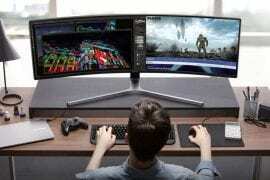 It is super compatible with most devices; iOS, Android, and Windows-powered devices. You can also listen to your favorite podcasts, FM radio stations, and Fire TV. Enjoy a hassle-free life with Echo Dot smart Bluetooth speaker. Schedule your daily events, set alarms, get updated on current news events, weather, and even traffic with simple voice directives to the voice assistant, Alexa. This Bluetooth speaker also has a hands free call & messaging feature that lets you receive phone calls remotely. You can also drop in on other compatible devices within range. For incompatible devices, simply connect via the aux-in 3.5mm audio input jack. Bluetooth: supports Advanced Audio Distribution Profile (A2DP) for uninterrupted audio streaming. It also supports Audio/Video Remote Control Profile (AVRCP) for smooth voice control. 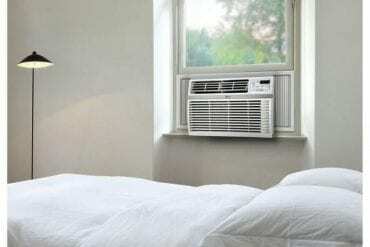 Compatibility: it is compatible with most smart home devices. You can also connect it to non-Bluetooth devices via the aux 3.5mm stereo audio input cable. Comes in different sizes; 1.6” & 2.5” with 0.6” tweeter, for an immersive audio experience. All the speakers are Dolby powered. 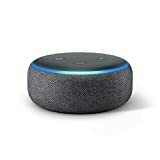 Echo Dot has an integrated Alexa function for easy control of all your smart home functions. Its built-in Zigbee smart home hub further enhances this. Supports music streaming from Amazon Music, Spotify, Pandora, and even SiriusXM. It has an integrated mic for a hands-free phone call and messaging function. Compactly designed and lightweight, the Doss SoundBox fits nicely in your adventure backpack for a very engaging on-the-go listening. It has a pair of 12W speakers that deliver deep bass for an incredible audio experience. It has a high-capacity rechargeable Li-ion battery for extended playtime. This Doss Touch Bluetooth speaker comes with a super-sensitive touch button with a unique Lacer Carving finish for easy switching between Aux-in, Micro SD, and Bluetooth modes. The simple touch function also lets you receive phone calls and send text messages hands-free. Doss Touch portable Bluetooth speaker offers a fantastic audio experience, thanks to the high definition stereo sound and imposing volume. Bluetooth: Bluetooth V4.0 compatible with most iOS, Windows and Android devices. Sound output: 12W full-bodied stereo with dual high-performance drivers and enhanced bass. Design: compact, lightweight and sleek. Its capacitive touch control lets you flip between soundtracks and also regulate volume with so much ease and flexibility. It is powered by a 2200mAh rechargeable Li-ion battery capable of long audio playtime. It delivers a powerful 12W full-bodied stereo sound quality courtesy of dual high-performance drivers and enhanced bass. Has an inbuilt mic that supports hands-free call and messaging function. The Anker Soundcore has a unibody design accentuated by smooth curved edges for an irresistible sleek finish. It comes in red, blue and black color varieties; you can be sure to get what matches your home décor and style. Enjoy a fantastic audio experience with rousing highs and deep lows. 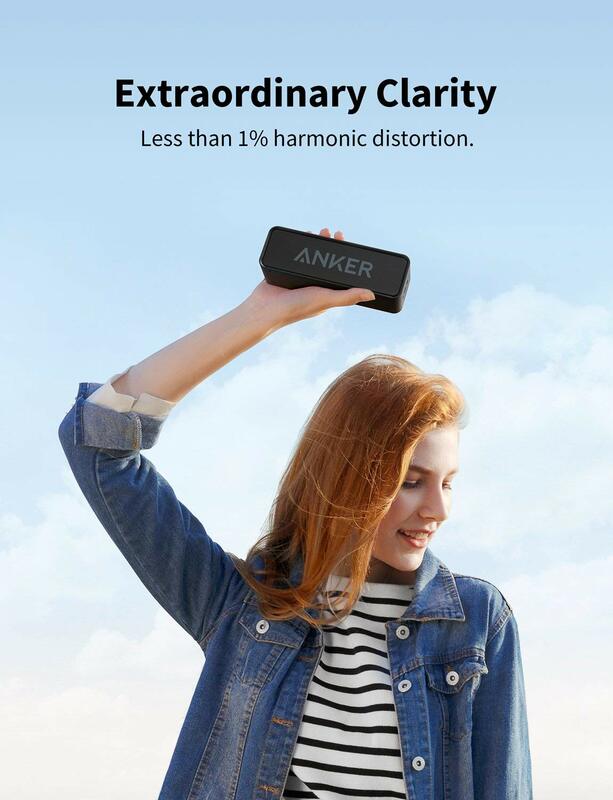 Anker SoundCore’s astonishing sound quality also has minimal harmonic distortion even when you crank up the volume. You will also appreciate the speaker’s worry-free battery life. It has a high-efficiency Li-ion battery that delivers up to 24 hours of sublime audio experience. It is very compatible with most iOS, Android and Windows devices for instant music playback. 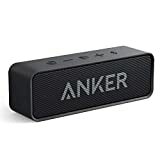 Devices that aren’t compatible can be connected to this portable speaker via the aux-in 3.5mm input jack. 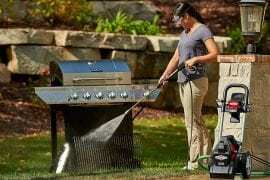 Has a robust, yet lightweight unibody design, perfect for outdoor as well as indoor use. It has Bluetooth V4.0 for instant pairing with compatible devices. You can also connect non-Bluetooth devices to Anker Soundcore via aux 3.5mm input connection cable. Has a high-efficiency Li-ion battery capable of up to 24 hours nonstop playtime. Has a stunning stereo sound with a deep bass. The crisp clear audio is delivered with zero harmonic distortions. The OontZ Angle 3 is expertly engineered by Cambridge SoundWorks. This is the embodiment of next-generation ultra-portable Bluetooth speakers. It is equipped with precision neodymium drivers for good quality highs and mid volumes. 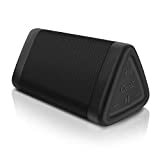 For enhanced audio clarity, this portable Bluetooth speaker has a triangular design that separates its drivers from the bass radiator. The OontZ Angle 3 is IPX5 waterproof rated, hence good for extreme water adventures. Take it with you to the beach, swimming pool or even shower and be sure to marvel at its stunning audio quality. It measures 5.25 x 2.6 x 2.8 inches and weighs just over 9.0 ounces, perfect for outdoor listening. Compatibility: pairs excellently with iOS and Android handsets. Audio quality: high-quality sound with zero harmonic distortion. Has a 10W peak sound output, good for an average sized room and outdoor use. It delivers a distortion-free audio performance at high and mid volumes. This portable Bluetooth speaker connects instantly with iPhone, Android smartphone, and even tablet. Non-Bluetooth devices like Chromebooks, Windows PC, and TVs can be connected to this speaker via the Aux-in 3.5mm audio input jack. This review has summarized some of the best portable Bluetooth speakers. 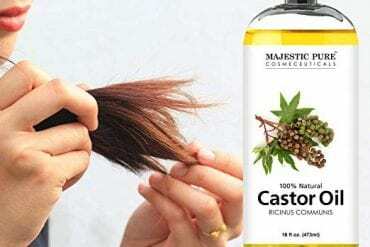 We have provided a detailed description for each product to help you make an informed purchase. 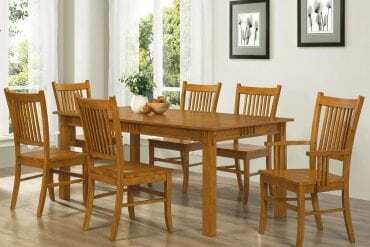 Be sure to compare the features of each product so as to get what suits you best.